The majority of pictures in this packet are LANDSCAPES. Discuss WHAT a Landscape is (an outdoor scene). This is a great packet for covering MOVEMENT, HORIZON LINE, FOREGROUND, MIDDLE GROUND, BACKGROUND, PLACEMENT, RELATIVE SIZE, OVERLAP, ONE-POINT PERSPECTIVE, and NEGATIVE SPACE. Much of the work of the earlier arts of the West was financed and encouraged by the United States government and American business. For example, Seth Eastman was an official illustrator for the Department of Indian Affairs in Washington. Other Western artists, such as Catlin, Bierstadt, and Moran accompanied official exploring expeditions. Their illustrations of the new frontier played an important role in the course of American history. Not only did these works encourage settlers to move out West; Moran’s representation of what is now Yellowstone encouraged Congress to create the national parks system. After the Civil War, the new mass media, particularly magazines, began to hire artists to create dramatic illustrations for their editions. Several careers were started and maintained by Harper’s Weekly alone and Scribner’s and Outing magazines were not far behind in this type of sponsorship. • Does the painting show a certain mood or emotion? • Does the painting have detail, or does it just give an “impression” of something? • Does the painting look real or not very real? • What is the season? Weather? Climate? What are the clues? • What is the time of day? • What is the period of time? Historic? Modern? • Does anything in the painting show MOVEMENT? • What do you “see”, “hear”, “feel” or “smell” in the painting? 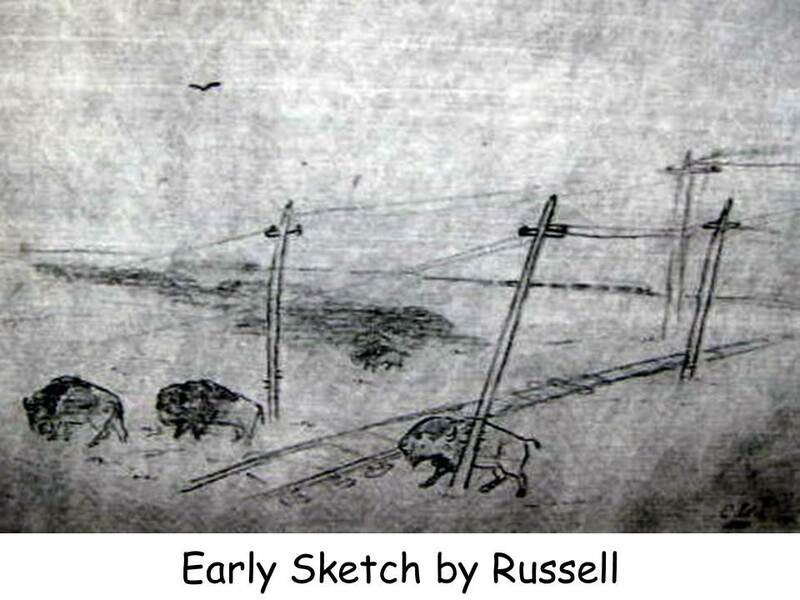 • If Charles Russell could paint the Landscape we see out of the classroom window, what details might he include? What COLORS might he use? 1. SIZE—objects that are close (FOREGROUND) are larger than objects in the distance (BACKGROUND). 2. PLACEMENT has to do with the different areas of a picture—FOREGROUND (front of the picture or the area closest to the viewer) is usually the lowest part of the picture. Foreground objects block out part of the things behind them (overlap). MIDDLE GROUND is the area in the center of the picture. Objects in this area of the picture give the illusion of being a little farther away than things in the foreground. BACKGROUND is usually placed higher in the picture. This gives objects the illusion of being farther away from the viewer. 3. The COLOR gets lighter or fades in the distance. Objects that are closer (FOREGROUND) have more color. WARM COLORS draw the viewer’s eye forward. COOL COLORS draw the viewer’s eye back across the canvas. 4. TEXTURES are more recognizable in the FOREGROUND. Textures become fuzzy in the distance (BACKGROUND). 5. DETAIL is very important. The closer the object, the more detail the artist adds. Objects farther away, in the distance, often just become simple shapes with color and no detail. 6. The VANISHING POINT is a very important aspect of perspective. This is the point where the horizontal and vertical lines meet. The VANISHING POINT gives the picture an illusion of DEPTH, as if the scene could go on forever. 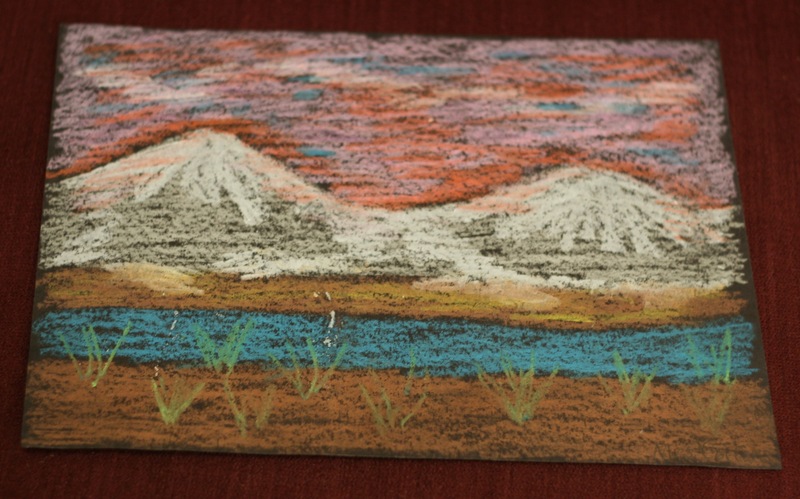 The artist could also use the vanishing point to direct the viewer’s eye to a particular place in the picture. Younger kids will not easily understand vanishing point but they can understand FOREGROUND, BACKGROUND, COLOR VALUE, SIZE and PLACEMENT. In a LANDSCAPE, the sky is usually the farthest away, in the BACKGROUND. The area that the sky occupies is called NEGATIVE SPACE. The areas of the MIDDLE GROUND and FOREGROUND are POSITIVE SPACE. This is the area that the artist wants the viewer to focus on, the area of DOMINANCE (emphasis, focal point). The action of the picture takes place in the POSITIVE SPACE. Charles M. Russell was born during the Civil War, on March 19, 1864 near St. Louis, Missouri. 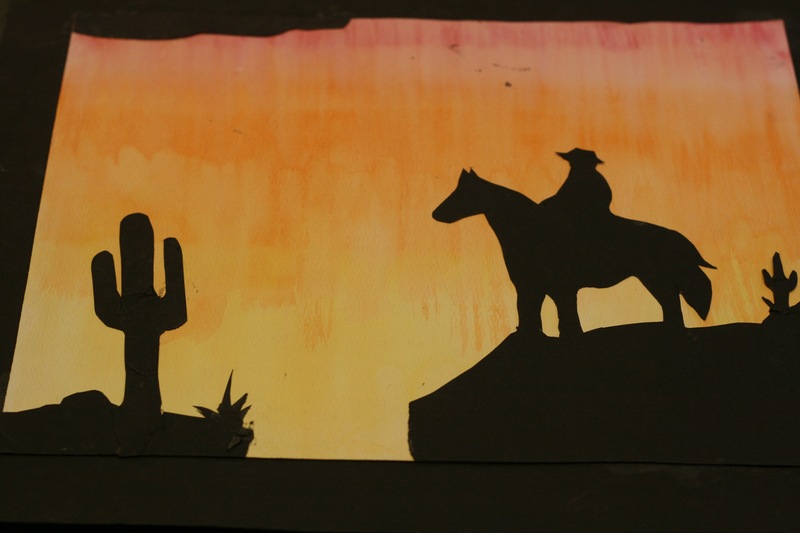 As a child he had two passions—drawing and a love of the West. In 1880, when he was 16, his father sent Charles to Montana for a summer vacation where he worked on a sheep ranch. His father thought the gritty reality of the west would bring the boy to his senses. He was wrong. Charlie found his first buffalo skull on his way west, when the stage he was riding stopped to rest the horses. It was the horned head of a bull bleached in the sun. The Buffalo skull meant something special to Charlie. In his early pictures, Charlie would paint a buffalo skull somewhere in the foreground. Later in his painting career, he joined a stylized buffalo skull with his own signature and eventually copyrighted that logo. In his later life, Russell called his summer lodge “Bull Head”. Charlie did not enjoy working with the sheep but he was glad that he was finally out in the west. Because he lost so many sheep, he also lost his job. Charley was broke and hungry when he met an old mountain man trapper named Jake Hoover. He spent two years working with Jake as a trapper before learning to be a cowboy. Russell was small, thin and wiry and was known to other cowboys and trappers as “Kid”. He started as night wrangler for about 400 horses. Soon Charlie was night herding cattle. It was the loneliest work a cowboy could do—he was a human substitute for a fence. A night herder kept cows from straying off or stampeding in the dark, calming them down with the sound of a human voice. Russell “sang to the horses and cattle,” as he put it, for eleven years and admitted that he was never a very good cowboy himself. In 1896 Russell married and his life changed entirely. The young couple was desperately poor but Mrs. Russell was a determined woman who made herself her husband’s agent and manger and saw to it that his works sold for what they were worth. “Mame’s the business end,” he would say, “an’ I jes’ paint…she could convince anybody that I was the greatest artist in the world… an’ yuh jes’ can’t disappoint a person like that.” He was soon quite successful, did book and magazine illustrations, had many exhibitions, saw his work reproduced on calendars and acquired a steady stream of famous collectors including Will Rogers and Douglas Fairbanks, Sr. Russell built a log studio in Great Falls, Montana where a sizable museum stands to his honor today. His pictures brought as much as $10,000 each. Nancy and Charlie Russell weren’t able to have children of their own. After 20 years of marriage, the couple finally adopted a baby boy named Jack. Because Montana winters were so cold, the Russells often went on winter trips to warmer climates with little Jack. The family even started building a winter home in Pasadena, California. While the house was being planned, the Russells named it Trail’s End. Charlie never lived to see the house completed. Doctors told Charley that he only had a short time to live. He warned the doctors not to tell his wife Nancy. However, 5he doctors did tell Nancy and she insisted that they not tell Charley. Each of them had always protected the other. After an operation for a goiter, Charlie Russell died of a heart attack on October 24, 1926. Charley preserved the history and tradition of the West he loved as only a working cowboy could. He was America’s only true cowboy artist! Charles Marion Russell was an artist who painted and sculpted the American West. When Charlie Russell painted the pictures we are going to see today, most people who lived in the Eastern United States had never seen the Western United States and had no idea what it looked like. 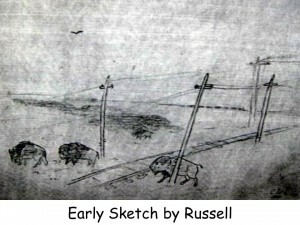 Most western areas in Russell’s time did not have paved roads. Nobody could just take quick snapshots of the American West and send these to the curious people in the east. The only way to see what the West looked like was to have someone travel there and draw it. Because so many people wanted to see the “Wild West”, many magazines and newspaper companies sent artists to sketch pictures. These simple line drawings were printed in magazines and newspapers all over the east. Many magazine and book authors (who had never seen the west themselves) made up exciting fictional stories of western adventures to go along with some of these drawings. Exciting and dangerous tales sold magazines and newspapers and made people believe that life was glamorous in America’s Wild West. Would any of you have liked the job of a magazine artist, to travel and draw pictures so that people could see what unknown places looked like? Why do you think artists didn’t just sit down and paint a picture while they were looking at it? Wouldn’t it have made it easier to get the colors “just right”? Why did artists wait until they got home to do their paintings? Charles M. Russell saw the West from the Indian’s point of view—not that of the typical white man. He portrayed white explorers and settlers as intruders, not as conquerors. When the white man first came to the west the Indians were curious about him and welcomed the trade goods he brought to them. However, the white man claimed the land for himself. He put up fences, plowed the land and muddied up the clear-flowing streams in search of gold. At first the Indian was mostly annoyed by the white man’s ways but he later got angry and tried to fight for his right to live on the land as his ancestors had done for generations before settlers came. Yet it was too late. 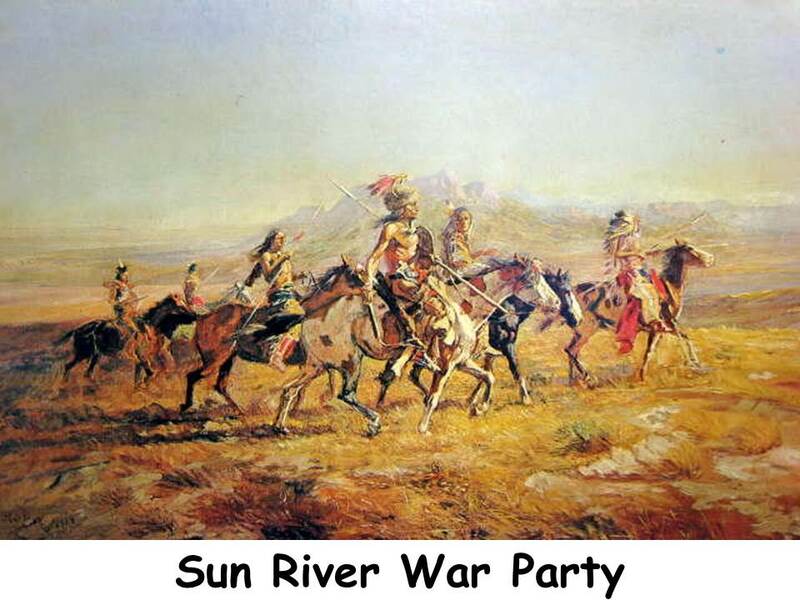 The white men outnumbered the Indians. They were organized into one civilization and they were determined to take over all the western land. The Indians weren’t united into only one civilization and had no property deeds to prove they owned the land. Because of this, the white settlers felt no guilt about taking (stealing) the Indian’s lands. This painting is typical of Russell’s meticulous work and gives accurate details of Indian costume and western sky. Montana air is often filled with fine, misty dust that softens the rocky contours of the land and lends this particular blending of pinks and golds to the distant background. 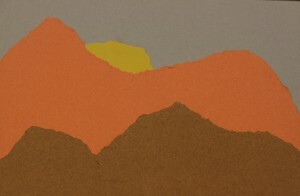 Notice how the landscape is created with broken LINES of COLOR in the FOREGROUND. 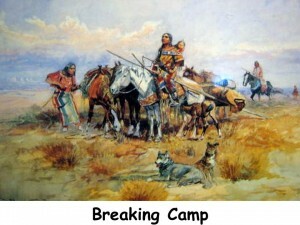 Are the Native Americans (Indians) standing still or moving? The REPETITION of the COLOR red causes our eyes to notice these men and to move from one man to the next, as we look at them closer. This painting has the artist’s signature (“C M Russell”), the year the picture was painted (1923) and Russell’s stylized buffalo skull logo painted in the lower left corner. You may be able to enlarge this on the classroom screen, with the teacher’s help. What is a Landscape? 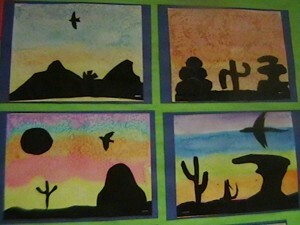 A picture of the outdoors, a scene you can see from a window. What type of Landscape do you notice around this elk? The area the elk is standing in is colored in mostly shades of browns, rusts and tans. The trees are bare and seem dead. The hillside in the right background seems barren except for a clump of green trees at the foot. The area in the left background seems greener and filled with more trees. Why do you think the landscape looks like this? It could be an area that is between a forest climate and a desert climate—like the area around Hood River, Oregon as it changes to the desert climate in The Dalles area (Columbia Gorge). A forest fire caused by lightening or a careless campfire could have damaged it. 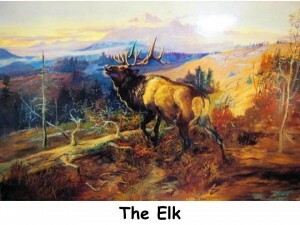 Compare this painting of an elk in the wild to the photograph of an elk. Does the painting seem as realistic as the photo? 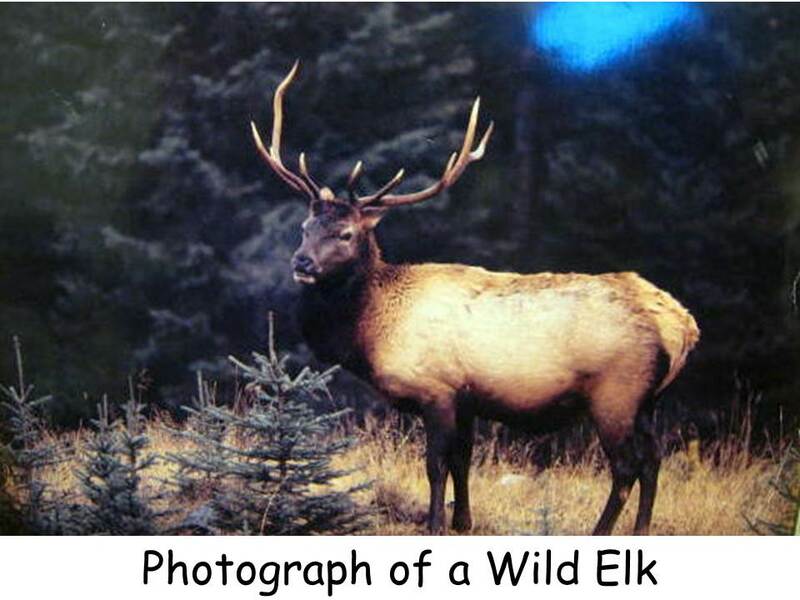 Find pictures of elk in books or magazines and bring into class. 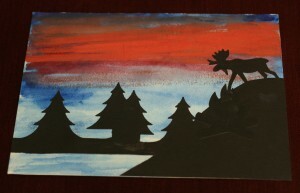 Have kids create an elk using cut paper. Point out his different features such as thick fur around head and neck, large antlers, light colored rump, different VALUES of brown all over his body. Kids may not be as critical of their artwork when making the elk from torn or cut paper rather than drawing. If you decide on torn paper, have kids draw the shape first and then tear around it. Do sections at a time—head & neck, antlers, body & legs, rump & tail. Glue to a forested background scene cut or torn from at least two alternating green VALUES of colored paper. 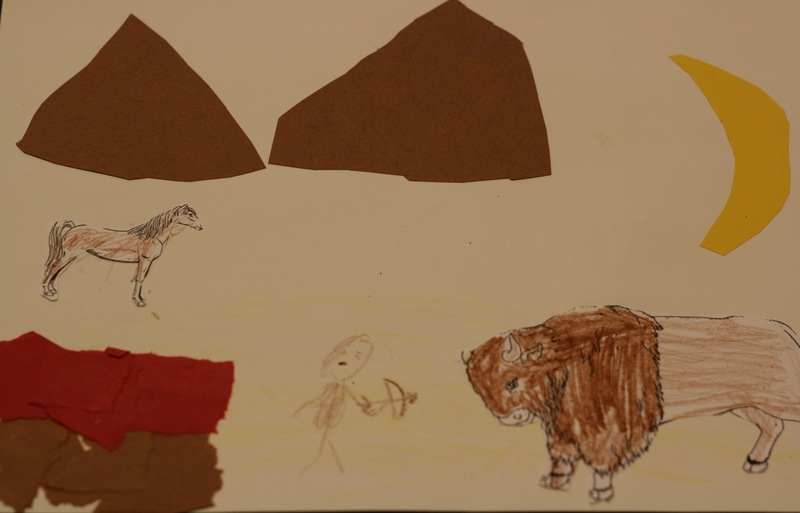 These Plains Indians are breaking camp to move where they can find food. Often moving meant following the buffalo herds. Their homes and all their belongings are bundled up and carried on the long sticks like a trailer. The Native American tipi worked as a “mobile” home for many Indian families for thousands of years. It could easily be taken down, folded up and pulled along on a horse Travois (trah voy) to the next place. The horse travois was made from two long wooden poles, which were tied by leather straps to the horse. Horses dragged the travois along the ground behind them to carry food, household goods and small children. 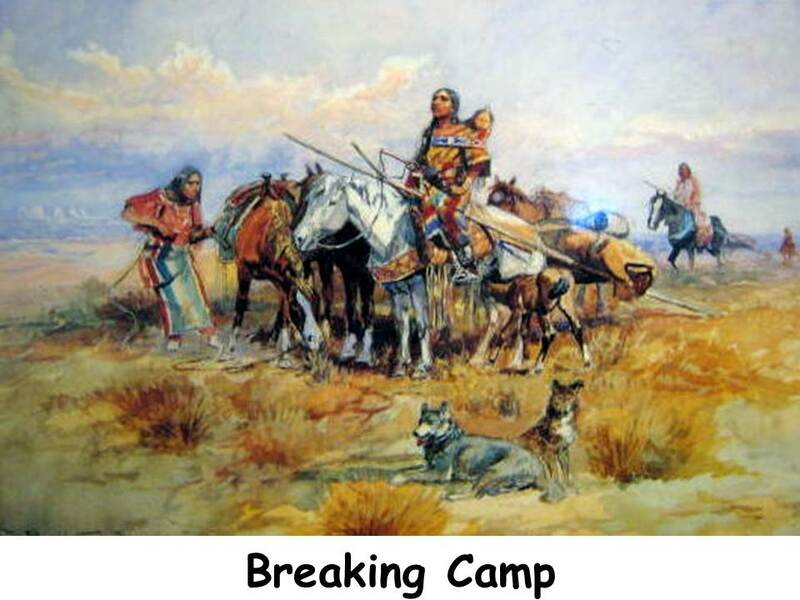 Before the Indians had horses (brought by the white man to America), dogs were used to help haul their belongings to the next camp. The packing and moving was usually left up to the women. For thirty years, this Montana Cowboy Artist toiled diligently to tell the story of the Old West. Because he resented the degradation that civilization had brought to his “Red Brothers”, in his paintings Russell preferred to present Native Americans in their primitive state (the way they looked before the white settlers came). 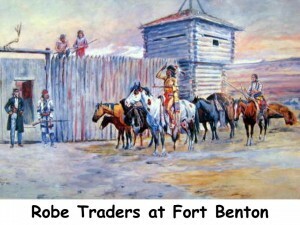 Although most Native Americans did not completely dress in their original native attire, many lived in permanent wooden structures and some drove wagons during Russell’s lifetime. Watercolor was used for this painting. 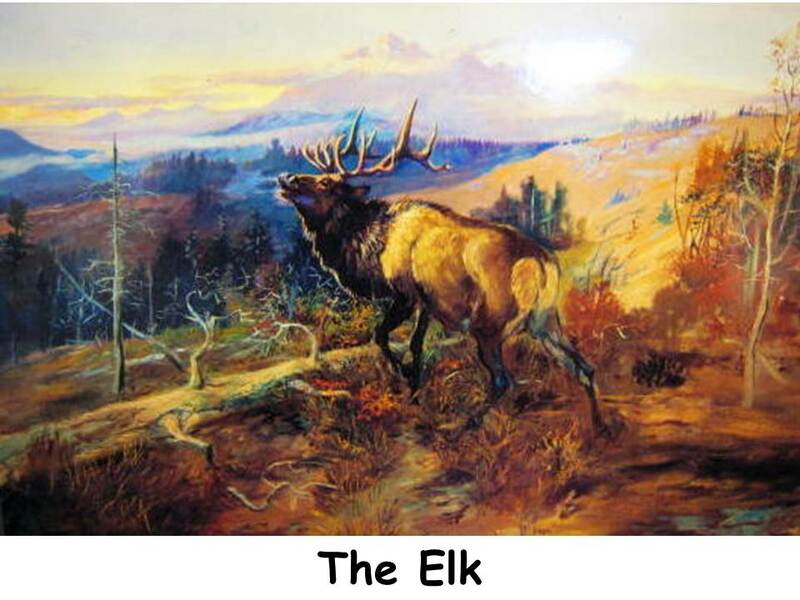 Compare The Elk, which was painted with oil paint, to the look of this picture. What do you notice? Oil paint can produce darker, richer color. Watercolor has a lighter, more pastel look to it. What is the FOCAL POINT of the picture? What does the artist want us to pay attention to the most? If you have a hard time figuring this out, trying closing your eyes partway and look for the thing that is easiest to see. The artist wants us to notice the strong Indian mother, sitting on her white horse with a child strapped to her back. She is in the front center of the group and is placed higher. Her white horse stands out against the various shades of brown horses. The red stripes of her clothing also help her stand out. Can you find any PATTERN in the picture? Striped clothing of the central figure and the figure on the far left, front of white horse has a triangle GEOMETRIC PATTERN band on the chest, central figure has a patterned horizontal band going around her at the shoulders. What COLORS did the artist use in the picture? What time of year do you think it is? What clues did the artist give us? Although there is a lot of golden grass, there is also a lot of green in the FOREGROUND and MIDDLE GROUND, which might indicate spring. 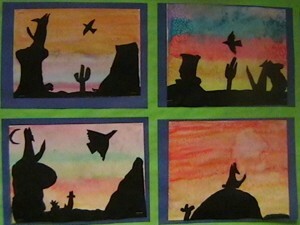 • Create a watercolor picture of the desert using watercolor and wet paper. Create clouds leaving areas with no paint. Use more water to make lighter and lighter shades and pink, like the clouds in this painting. Use more water to create lighter shades of blue for the sky. If the blue is too dark, add water and brush until the color is what you want. Basecoat the ground with a golden yellow color and let it dry. 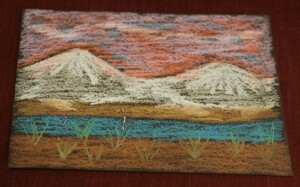 After it has dried, create tufts of grass using crayon, markers or watercolors. • Create Indian Teepees and decorate with Indian designs. Use twigs glued to the top of the teepee. • Create Indian vests from brown grocery sacks turned inside out and crumpled to achieve a similarity to leather. The American “Buffalo” is not the correct name for this animal. It is really a Bison. At one time, millions and millions of Bison roamed the Plains of America. As the white man moved west into the Indian Territory, he began to destroy this magnificent and mighty creature. Native Americans of the plains depended on the Bison for most of their food and for warm blankets and robes to protect them from the fierce winter storms of the plains. The Indians wasted not one part of the Buffalo. Eventually the white man diminished this Native American food source until American Bison (Buffalo) were almost extinct. The Blood Indians of Alberta (who Charlie lived with) have a group called the Buffalo Society. The members of this society were not supposed to break any of the buffalo skulls because these were considered very sacred. The spirit of the buffalo was known in Native American prayers as leader of all four-legged animals. 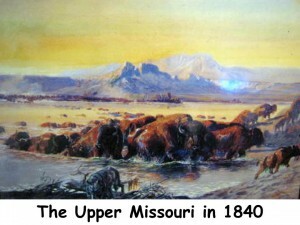 This painting shows Buffalo crossing the upper Missouri River in 1840. That was 24 years before Charles Russell was even born (1864). Charley painted this picture in 1902. Did the artist paint this scene from his own observations as he rode his horse in the western wilderness? No, the artist painted this in 1902 and the title of the picture includes the year 1840, which was more than two decades before Russell was born. Why do you think the artist chose such a strange name for his painting? 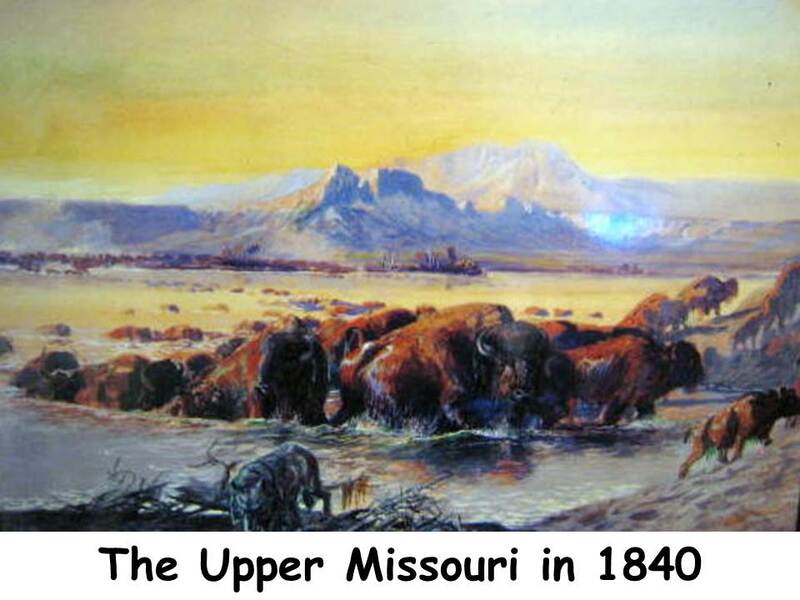 The painting shows how this area of Montana looked before civilization came. 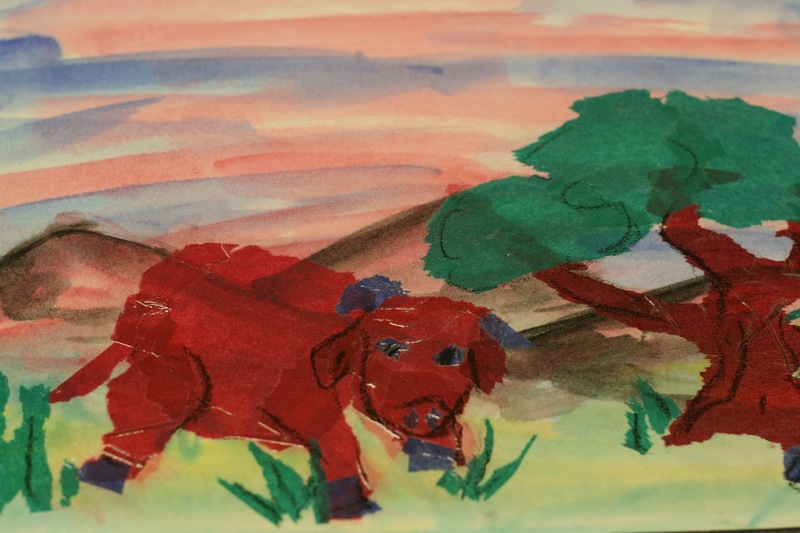 Charlie painted a time when the buffalo were free to roam the prairies, before settlers built cities, fences and railroads across them. He felt a little sad that the “old west” of his boyhood was so modernized. He didn’t like many of the things that modern people had done to change the wild country by the time this picture was painted in 1902. There are more Buffalo in the water behind these near the shoreline. It appears that the distant shoreline of the BACKGROUND has many, many more Buffalo that haven’t yet reached the water. Do you see the dark spots of color in the water? Packs of prairie wolves always followed the large herds of buffalo. They fed on the old and weak animals and it was the way nature kept things balanced. Do you notice anything unexpected about this wolf? He is also wet, so he must have crossed the river along with the buffalo. The wolf isn’t even paying attention to the buffalo behind him. The buffalo don’t seem too concerned about him either. You may think that most artists would paint the wolf as viciously attacking the bison for his dinner. Yet, the buffalo aren’t afraid of the wolf because they are used to wolves traveling along with them. The wolves would only attack if they needed food and there were so many buffalo these animals didn’t usually need to worry too much about a wolf. • Make Buffalo from pieces of brown fake fur and felt. Use the fur for the woollier head area and the felt for the rest of the body. Glue on wiggle eyes. Glue the Buffalo to a painted or drawn prairie Landscape. • Sculpt a Buffalo from clay. Use a toothpick to create the wooly TEXTURE of fur on the forelegs and hump. In old movies you rarely see a realistic picture of U.S. soldiers and Indians. Most cowboy and Indian movies show the Indians attacking the Fort and the soldiers and cowboys defending it. The Indians are usually always depicted as the bad guys. Do these Indians look like “bad guys”? No, they seem peaceful. What clues give you this idea? 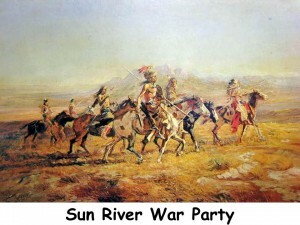 The Indian in the center of the painting (on the horse) is holding a peace pipe and seems to be speaking to the soldiers in sign language. (The Blood Indians taught Charles Russell how to speak in Indian sign language.) Although they are holding rifles, neither the soldiers nor the Indians seem alarmed about anything. Have any of you ever been down to Fort Vancouver? 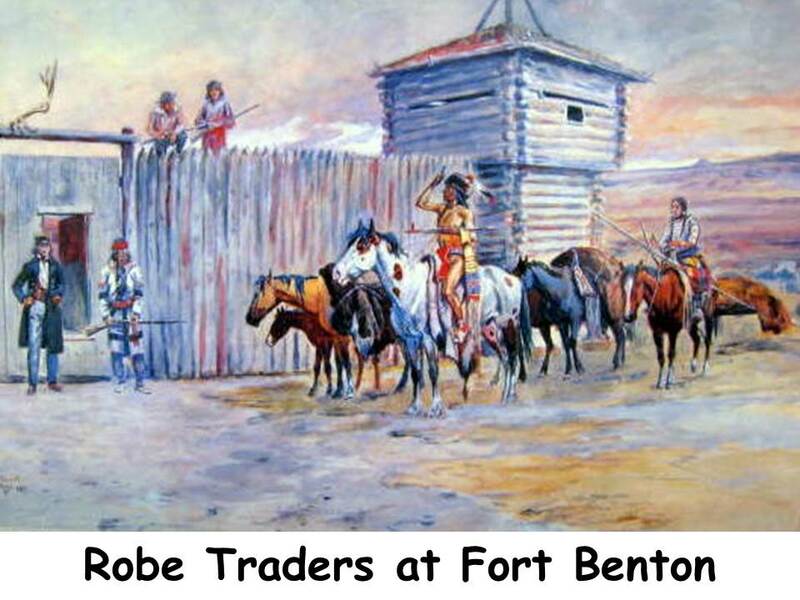 Does this Fort remind you of Fort Vancouver? In this picture, MOVEMENT is created with REPITITON of the COLOR red. Beginning under the left side of the antlers over the gate, to the opened gate door, the red COLOR moves our eyes across the picture towards the right. Where can you see the REPITION of a BLUE? Use Popsicle sticks to build a Fort on corrugated cardboard. Small squares of Styrofoam also work well for a base. Poke sticks into the Styrofoam to stand. Twigs could also be used but quite a few would need to be cut for a whole class. Fort Vancouver has a coloring book that gives instructions for building a Fort with Styrofoam, Popsicle sticks and construction paper. Bring in photos or postcards of Fort Vancouver. This type of a project will usually need to be done in two parts. The sticks need to be glued together for the first part of this project. Lay them on waxed paper to dry. They will pop off the waxed paper easily, once dried. Assemble the forts for the second part of this project. Russell was born During the Civil War. In those days people rode horses or used wagons or buggies pulled by horses. Trains were the fastest modern invention of those times. Russell’s life was lived during the end of the cowboy days and the beginning of modern industrial civilization. The world of transportation changed dramatically during his lifetime. Does this painting give you any clues about what Charles Russell thought of the modern automobile? Does this picture tell a story? 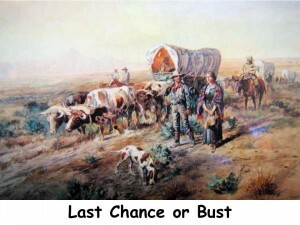 The trip west, in the 1800’s, was not an easy one. It usually took about 6 months. Pioneers had to leave early in the spring and hope they could make it over the mountains before winter snows set in. Sometimes the snows came early so it was dangerous to leave very late in the spring. There weren’t any stores along the way, to stop and pick up supplies, so the pioneers had to bring all the food, clothing, blankets, tools and supplies they would need for the trip. They also brought things for their new home in the west. Wagons weren’t large. Most children were only able to bring one special toy, if they were able to bring any. There weren’t any paved roads on which to travel. Most of the trail was dry and dusty, and most pioneers walked for the entire trip. 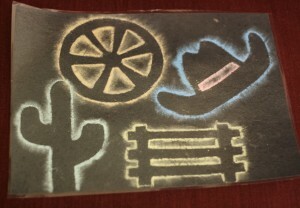 It was uncomfortable to ride in the wagons because it was an extremely bumpy, dusty ride. 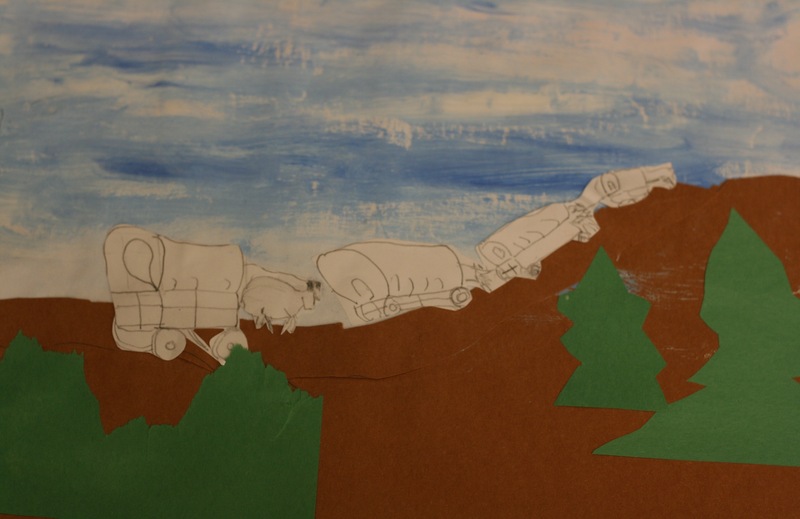 The pioneers needed all the wagon space to store their supplies. If passengers had ridden in the wagon, there might have been less room for food or blankets. The prairie got cold at night, so blankets were as important as food. 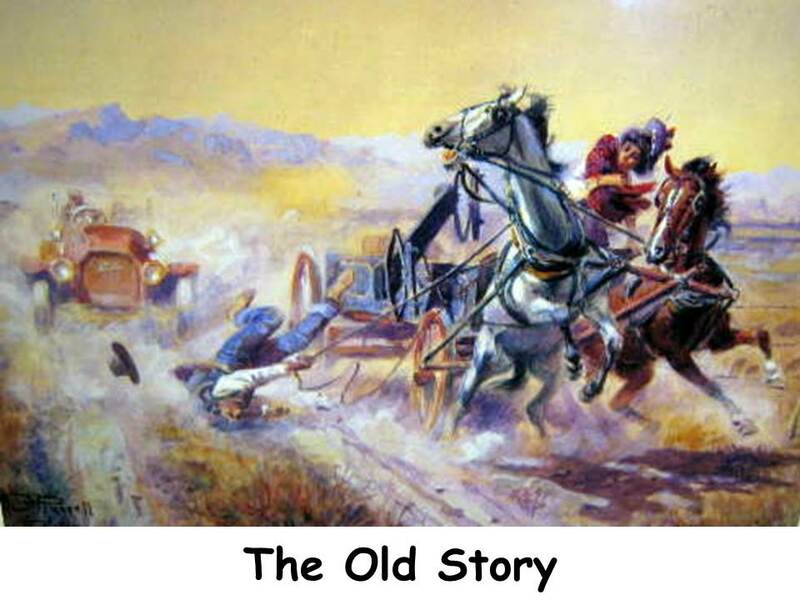 Oxen were usually used to pull the wagon. They were stronger than horses. Life was hard on the trail for the pioneers. It was also hard at the end of the trail. Most of their destinations were not even towns yet. There weren’t any stores or restaurants at the end of their trip. There usually wasn’t even a house to live in until the next summer. Usually pioneers had to plant crops as soon as they arrived in order to harvest a crop to eat the next winter. There weren’t any luxurious bathtubs to soak their tired, dusty bodies in after the long hard trip. There wasn’t even any time to rest. They had to get things ready before the winter came. Yet they still moved west. It was an opportunity for a better life for most of them. Eventually towns and cities grew and made life easier for the pioneers. Soon railroads made the trip faster and easier. 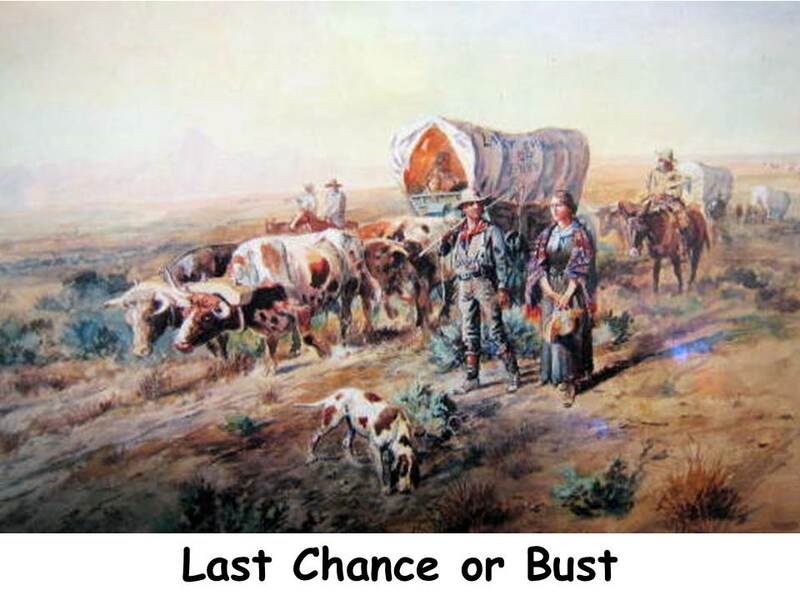 More and more pioneers headed west and more and more Indians lost the lands of their ancestors. Did he say this because he didn’t like the people he was talking to? No, he said it because he wished the pioneers, who represent modern civilization, had not changed the land so much. Russell admired the Indians who didn’t destroy the land. He knew that the Buffalo could never be brought back and the Indians who had been moved to the reservations could never live as they once had. What time of day is it? What clues did the artist give us? The pioneers are headed west and the sun sets in the west. The sun is low on the western horizon, ahead of the pioneers, so it is evening. We can see this by the long shadow cast behind the tired woman. The woman also appears as if it has been a long hard day of travel. Even the man on the horse behind her sits in a weary pose. • Make covered wagons from Popsicle sticks and pieces of white sheeting. The covers could be held up using florist wire under the cloth. • Cut covered wagons from construction paper and glue to a desert or mountain background. Add oxen, snakes, cactus or coyotes. Who can describe what is happening in the picture? What does the man’s expression at the cabin door tell you? What kind of clues does this painting give us about the personality of Charles Russell? Russell liked people and he had a very good sense of humor. Everyone liked him too. He must have thought Christmas and Santa Claus were a lot of fun. Santa looks pretty happy in this picture. If it is Christmas Time when you get this packet you are very LUCKY! This picture will be much more fun to discuss then. You can also do projects with Christmas in mind. • Make log cabins using pretzel sticks glued to small milk cartons on a small cardboard base. Gather them ahead of time at the cafeteria and rinse them out. Glue door, windows and roof on made from construction paper. Using a small tube of bathtub caulk to make icicles hanging from the roof and logs, using a Popsicle stick with a dab of caulk. Touch the caulk to pretzels and edge of roof lightly and pull away, leaving what looks like icicles. Clear glitter can be glued to the top of the roof. A little caulk piped around the base of the log cabin will look like snow. A green wreath of construction paper with a small bow of skinny ribbon could be glued to the door to make it more festive. • Trace a toy bag for Santa on large Construction paper for each child to cut out. 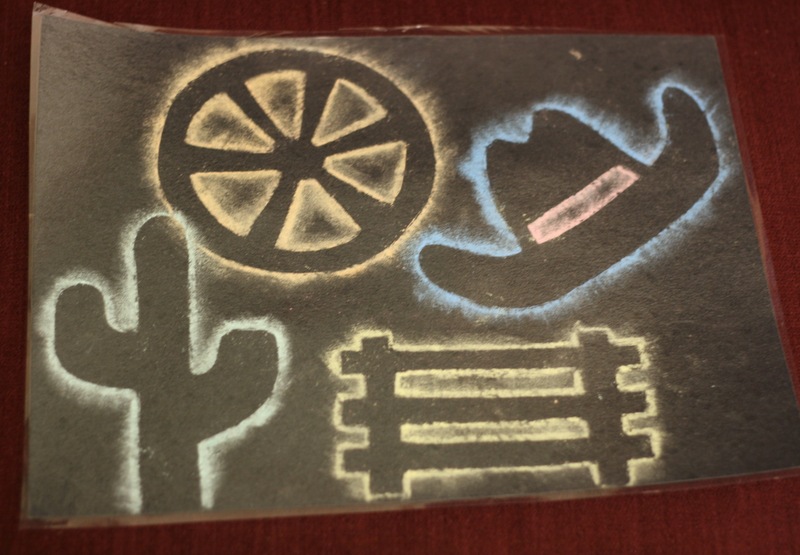 Discuss the kinds of things cowboys might like for a present—cowboy hat, boots, lasso, spurs, bandana, saddle, harmonica, warm winter coat, warm winter socks (red? ), Christmas goodies to eat, a new horse, etc. Have kids make, and glue to the toy bag, the presents Santa would give these cowboys. Two bags could be hinged with tape to make the gifts inside the bag. The top bag could be plain and the gifts would be glued to the bag underneath. • Write a Christmas story about this picture. Has the cowboy been a good boy this year? Why did Santa decide the cowboy needed a visit? Why didn’t Santa just secretly drop off gifts while the cowboy was sleeping? 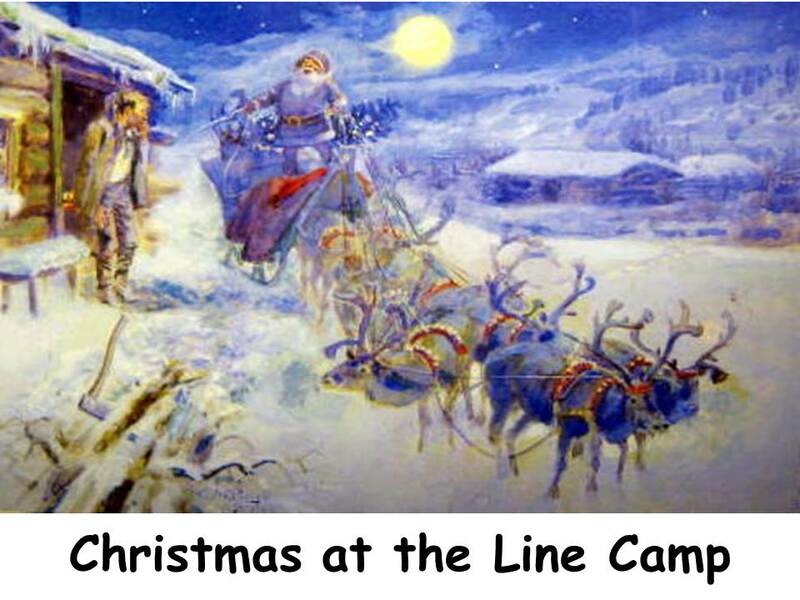 • Draw a picture about what happened after the cowboy saw Santa at his door. Charlie Russell was a colorful and creative man. This is apparent not only in his art, but in his writing. In the many letters and stories he wrote, he often made spelling, grammar, and punctuation mistakes. Fortunately, that never stopped him from sharing his good-humored thoughts about life. The poem to the left is written in his original spelling and grammar. The poem on the right has been somewhat corrected to make it easier for you to read. Charlie may have had a better grasp of English than his letters and books imply. But he liked the folksy lingo of the cowboy. He may have intentionally misspelled and misused words to give his yarns more color. By doing so, he preserved for us the sounds as well as the sights of the Old West.